SNA released its 2017 School Nutrition Trends Report, a summary of findings from a survey conducted with SNA members. The report contains information on menu trends related to student customization, flavor trends and clean label ingredients. 60% of responding districts are offering new menu items that feature international flavors, 56% report serving cleaner label choices and over half offer made-to-order or self-serve entrée bars! The survey also revealed that school nutrition professionals have employed a wide range of tactics to meet sodium and whole grain regulations, but continue to face challenges and express concerns about meeting those particular mandates. For more information, check out SNA’s press release on the report, or read the report summary here. SNA submitted a comment in response to the U.S. Department of Agriculture’s (USDA) Federal Register Notice on July 17, 2017, Identifying Regulatory Reform Initiatives, which requested ideas from the public on how USDA can provide better customer service and remove unintended barriers to participation in their programs. SNA used the responses collected from the survey sent out about the topic to highlight priority areas where reforms should be directed. Those priority areas include ensuring that students from food insecure households are not “priced out” of the school nutrition programs due to paid lunch equity, streamlining the multiple program regulations for school districts operating multiple child nutrition programs, offering flexibility in the variety of fruits and vegetables being offered, and understanding the impact of Smart Snacks on fiscal sustainability. SNA will continue to provide feedback and raise additional ideas for change in order to promote healthy meals for our nations’ students. SNA was honored to collaborate with Congressman Rodney Davis (R-Ill-13) in developing a special recognition for school nutrition professionals, which Rep. Davis delivered in the United States’ House of Representatives on Wednesday, September 13, 2017. The recognition highlighted all the important work that school nutrition professionals do every school day to ensure that children are eating healthy, balanced meals that enable them to succeed and work their hardest in the classroom. School nutrition staff are a vital part of the education system, and you should take special pride in the work you do feeding millions of children and making their lunchroom experience an enjoyable one. SNA, and Congressman Davis on behalf of the U.S House of Representatives, are enormously proud to honor you and recognize your hard work. SNA is also excited to share our new advocacy video, which helps to explain some of the challenges and goals of school meal programs. The video features several SNA members discussing the positive impact of school nutrition professionals on the lives of students, and why it’s important to serve nutritious, balanced school meals. Feel free to share this video at your state meetings and with your local legislators! U.S Secretary of Agriculture Sonny Perdue announced on Wednesday, July 19, the names of three new individuals who will be taking leadership roles within the U.S Department of Agriculture. Brandon Lipps will serve as the Administrator of the Food and Nutrition Service (FNS), while also serving as Acting Deputy Under Secretary of Food and Nutrition Consumer Services (FNCS) until a permanent appointee is nominated by the president and approved by the Senate. Previously, Lipps worked for the Texas Tech University System as the Chief of Staff and Director of Federal Affairs in the Office of Chancellor Robert Duncan, served as counsel and senior professional staff to the U.S House Committee on Agriculture, and held various positions under Chancellor Duncan while he served as Texas State Senator. Maggie Lyons will serve as Chief of Staff and senior advisor to the Under Secretary. Before joining the USDA, Lyons was the Senior Government Relations Director for the National Grocers Association (NGA) and worked on Capitol Hill in both the House of Representatives and the Senate. Lastly, Kailee Tkacz will serve as policy advisor to the Under Secretary. Her work experience includes serving as the Director of Food Policy for the Corn Refiners Association (CRA), Director of Government Affairs for the Snack Food Association and Government Affairs Manager for the National Grocers Association. Also on Wednesday, the White House sent the Senate Agriculture committee its official notice of intent to nominate Stephen Censky for USDA Deputy Secretary. Censky previously served at USDA in both the Ronald Reagan and George H.W. Bush administrations and worked on the 1990 farm bill. He most recently served as the American Soybean Association’s Chief Executive Officer for 21 years. You can view an organizational chart of these positions and others within USDA on the USDA website. USDA posted a revised policy update titled Donated Food Storage, Distribution, and Product Dating, which affects the National School Lunch Program (NSLP), Child an Adult Care Food Program (CACFP), Summer Food Service Program (SFSP), Commodity Supplemental Food Program (CSFP), Food Distribution Program on Indian Reservations (FDPIR), The Emergency Food Assistance Program (TEFAP) and Charitable Institutions. The memo is intended to provide clarification and guidance on policies and procedures for donated food storage and distribution as they relate to product dating. Besides this guidance, more resources can be found on the USDA Food Safety and Inspection Service website and on the USDA Foods Complaint Procedure website. USDA issued a policy update providing multiple resources for SY 2016-17 reporting guidance for the FNS-640 report, also known as the Administrative Review Report Form. The Report Form is scheduled to be available in the Food Programs Reporting System (FPRS) in January 2018. The Food and Nutrition Service (FNS) outlines some reporting flexibilities in their memo on the report. The resources found within the policy update regarding FNS-640 include: a Reporting Guidance Memo; Instructions Summary of Revisions; FNS-640A Revised Instructions; FNS-640B Revised Instructions; FNS-640A Data Fields with Location; and FNS-640B Data Fields with Location. Technical assistance and training to support State Agencies’ implementation of the revised form is being offered, and state agencies with questions should contact their FNS Regional office. In a Federal Register Notice published on December 14, 2017, USDA announced an information collection on food crediting for Child Nutrition Programs (CNPs). CNPs must reflect the meal patterns and nutrition standards set forth by USDA in order to claim federal reimbursement, and crediting is the process designed by USDA’s Food and Nutrition Service (FNS) to specify how individual food items contribute to those meal patterns. The Request for Information is intended to help FNS gather feedback from stakeholders on how the crediting system can be improved, as well as to offer customer service to those operating and benefiting from CNPs. Electronic comments are preferred and may be submitted to the Federal Register by February 12, 2018. More information can be found in USDA’s press release. The USDA released a policy memo on May 3, 2017, announcing their Revised Prototype Application for Free and Reduced Price Meals for SY 2017-2018. 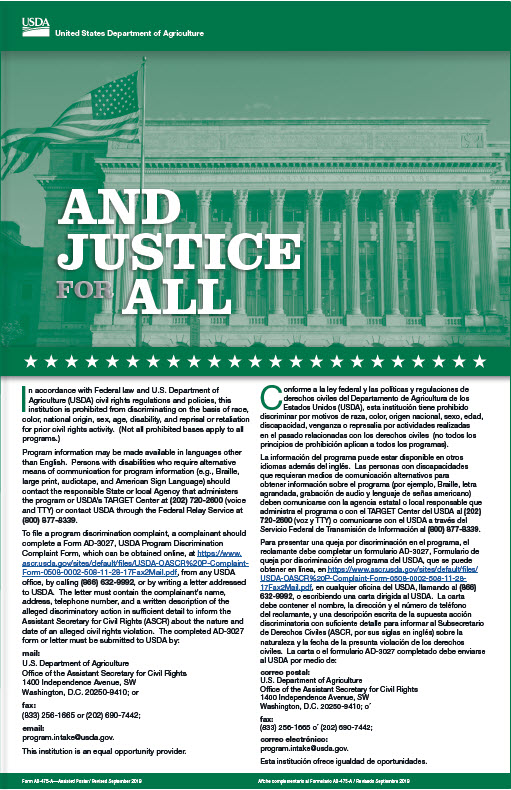 In SY 2016-2017 the USDA Office of Civil Rights received 1,700 of these applications in error, as they were actually intended for local officials who make eligibility determinations, and not complaints of discrimination. The applications were forwarded by USDA to the appropriate State and local agencies, and in an effort to make sure the applications go to the right place this year, minor design changes were made in the Prototype Application for Free and Reduced Price School Meals. FNS has added, to both the heading of Step 4 of the prototype application and Step 4 in the instructions, a field for program operators to include a mailing address where households may send completed applications. These headings are added to provide additional clarity on where to send the applications, and although inclusion of these elements on application forms developed by State agencies and LEAs is optional, it is encouraged. Attached to the memorandum are the application instructions, a Word version of the application, and a PDF version of the application. On Thursday, June 21, 2017, Senator Collins reintroduced the “ School Food Modernization Act,” or S. 1402, on behalf of her and Senator Heitkamp. The bill requires the Secretary of Agriculture to make loan guarantees and grants to finance certain improvement to school lunch facilities, train school foodservice professionals, and for other purposes. These improvements can include remodeling, purchasing durable equipment, and expanding the infrastructure of the school lunch program that will provide healthy meals. The loan guarantees and the equipment grants will be awarded on a competitive basis and up to the discretion of the Secretary of Agriculture, though certain eligible entities will have priority. S. 1402 goes on to outline fees, funding, and Federal share breakdowns for these programs, as well as for the training and technical assistance for school food service personnel. The bill was referred to the Senate Committee on Agriculture, Nutrition and Forestry. On Wednesday, June 20, 2017, Rep. Tim Ryan introduced H.R. 2967, or the “Nutrition Coordinators for Local Healthy Youth Act,” which was referred to the House Committee on Education and the Workforce. The bill amended the Child Nutrition Act of 1966 to establish a grant program to appoint nutrition coordinators to oversee local school nutrition policies in local education agencies. The Secretary of Agriculture, in consultation with the Secretary of Education, will select local education agencies to receive the grants, based on the applications that they submit, which are up to the Secretary to design. The coordinator role is to ensure compliance with local school wellness policies, conduct trainings and information sharing of best practices and to collaborate with other coordinators. USDA has released new reimbursement rates for the National School Lunch Program (NSLP), School Breakfast Program (SBP), Special Milk Program and Afterschool Care Programs. The rates were published in today’s Federal Register. Reimbursement rates for the Child and Adult Care Food Program (CACFP) are also available .A third notice published today announces the value of donated foods, specifically the national average value of donated foods or, where applicable, cash in lieu of donated foods for each lunch served by schools participating in the NSLP and for each lunch and supper served by institutions participating in the CACFP.The new rates and value of donated foods apply to School Year 2017-18 and are effective July 1, 2017 through June 30, 2018.Click here to see charts. Today, President Trump released his fiscal 2018 budget request, A New Foundation for American Greatness. The request, presented to Congress, outlines in detail the President’s proposal to streamline spending making bold and specific policy priorities, and includes economic and accounting analyses. This follows up on the President’s ‘skinny budget,’ which was released March 13, 2017. President Trump is calling for a $3.6 trillion slash in spending over the next 10 years. For FY 2018, the request calls for $668 billion in defense spending, $22 billion above current spending; and a $479 billion budget for non-defense programs, which is $57 billion less than current spending. Proposed SNAP funding would decrease more than $190 billion over 10 years – which is a decrease of over 25%. In addition to the White House budget, it is worth noting that Congress is beginning their Fiscal Year 2018 appropriations process. In fact, USDA Secretary Sonny Perdue will appear tomorrow, at a USDA Budget Hearing before the House Committee on Appropriations, where he will undoubtedly field questions pertaining to the proposed cuts to Agriculture programs. That hearing is 10:00 am ET and will be webcast. The School Nutrition Association is reviewing the budget in detail, paying special attention to White House recommendations related to USDA’s Food and Nutrition Service and any impacts to school meal programs. Sign up for SNA’s legislative and regulatory newsletter, Tuesday Morning, to ensure you are up to date. On May 4th, 2017, Representative Kristi Noem (SD-At Large) introduced H.R. 2382, or the Permanent Flexibility for Schools Act. The bill amends the Richard B. Russell National School Lunch Act and the Child Nutrition Act of 1966 to remove some Federal nutrition requirements. The bill essentially changes the words “nutritional requirements” to “nutrition guidelines” in the two previous bills, and thus does not necessitate school meals to definitively meet the standards that they laid out. The Permanent Flexibility for Schools Act has been referred to the House Committee on Education and the Workforce. As you may have heard, Congressional leaders have agreed upon an FY17 omnibus spending bill. The vote in both the House and Senate will occur sometime this week. Attached is the summary for the Ag Appropriations portion. CN Programs info is attached and below:Food and Nutrition Programs – The legislation contains discretionary funding, as well as mandatory funding required by law, for food and nutrition programs within the Department of Agriculture. This includes funding for the Special Supplemental Nutrition Program for Women, Infants, and Children (WIC), the Supplemental Nutrition Assistance Program (SNAP), and child nutrition programs.Women, Infants, and Children (WIC) – The bill provides $6.35 billion in discretionary funding for WIC, which is the same as the fiscal year 2016 enacted level. Because of robust prior-year funding and declining enrollments in the program, WIC has record levels of carryover balances left over from previous years. Therefore, to make the best use of taxpayer dollars, the bill rescinds $850 million of these unobligated balances, which will have no impact on participation in the program.Child nutrition programs – The bill provides for $22.8 billion in required mandatory funding – which is outside the discretionary funding jurisdiction of the Appropriations Committee – for child nutrition programs. This is $644 million above the fiscal year 2016 enacted level. This funding will provide free or reduced-price school lunches and snacks for 31 million children who qualify for the program. The bill provides more than $627 million for the Summer Food Service Program to ensure low-income children continue to receive nutritious meals when school is not in session. In addition, the bill continues funding for a pilot program that provides additional funds through SNAP or WIC electronic benefit transfer (EBT) cards to ensure children in underserved communities receive food during the summer months.The bill also stops an Obama-era school meal regulation from being implemented – providing flexibility for whole grains and milk and preventing changes to sodium standards that have not been fully scientifically vetted. FOR IMMEDIATE RELEASE Contact: Elizabeth Cowles Johnston 860-426-9991 ext 20; ecowles@cjpr.com 5/1/17 NATIONAL HARBOR, MD – School Nutrition Association (SNA) joined U.S. Department of Agriculture Secretary Sonny Perdue as he released an interim rule seeking regulatory flexibility for school meal programs. Today's commitment by Secretary Perdue addresses concerns raised in SNA's 2017 Position Paper, which requested maintaining Target 1 sodium levels and restoring the initial requirement that at least half of grains offered through school meals be whole grain rich.While SNA supports preserving robust federal rules, the Association has continued to advocate for practical flexibility under federal nutrition standards to help ease menu planning challenges and appeal to diverse student tastes. "School Nutrition Association is appreciative of Secretary Perdue's support of school meal programs in providing flexibility to prepare and serve healthy meals that are appealing to students. School nutrition professionals are committed to the students they serve and will continue working with USDA and the Secretary to strengthen and protect school meal programs," said SNA CEO Patricia Montague, CAE.Members of SNA have advocated for flexibility to address overly prescriptive regulations that have resulted in unintended consequences, including reduced student lunch participation, higher costs and food waste. The Association recognizes that providing schools practical flexibility has been supported by Senator Pat Roberts, Chairman of the Senate Committee on Agriculture, Nutrition, and Forestry, and Congressmen Robert Aderholt, Chairman of the Subcommittee on Agriculture, Rural Development, Food and Drug Administration and Related Agencies for the House Appropriations Committee.In addition to requests for practical flexibility under federal nutrition regulations, SNA has called for protecting school meal programs from block grant proposals and expanding USDA Foods to support the School Breakfast Program. 4/25/17NATIONAL HARBOR, MD – The non-profit School Nutrition Association (SNA), representing 57,000 school nutrition professionals nationwide, welcomed the confirmation of former Georgia Governor Sonny Perdue as Secretary of the US Department of Agriculture.“School Nutrition Association looks forward to working with Secretary Perdue to find ways to strengthen school meal programs, which support the success of more than 30 million students each school day,” said SNA President Becky Domokos-Bays, PhD, RD, SNS. “We hope Secretary Perdue will be a champion for these programs, which have ensured students have access to healthy meals at school for more than 70 years.”More than 900 school nutrition professionals participated in SNA’s Legislative Action Conference and Charge to the Hill earlier this month to advocate on behalf of school meals and students. SNA has called for protecting school meal programs from block grant proposals, expanding USDA Foods to support the School Breakfast Program and granting practical flexibility under federal regulations for school menu planners. Click here to read SNA’s 2017 Position Paper. Click here for full article on SNA's website. Every school day, school nutrition programs contribute to the health, well-being and achievement of more than 30 million students across America. To sustain this success, school meal programs require greater support. The School Nutrition Association (SNA) represents 57,000 professionals who serve students nutritious meals while being responsible stewards of federal funds. SNA urges Congress and the Administration to bolster historically under-funded school meal programs that are struggling to manage increased food and operating costs. While school meals should continue to meet robust federal nutrition standards, requirements must be streamlined to ease regulatory burdens and preserve the financial sustainability of school meal programs. Given the reality of the federal deficit and the absence of a Child Nutrition Reauthorization bill, SNA requests that Congress. Restore the initial requirement that at least half of grains offered through school lunch and breakfast programs be whole-grain rich. The current mandate that all grains offered be whole grain rich has increased waste and costs, while contributing to the decline in student lunch participation. Students are eating more whole grain breads and rolls, but schools are struggling with limited availability of specialty whole grain items and meeting students’ regional and cultural preferences for certain refined grains, such as white rice, pasta, grits, bagels or tortillas. View a printable version of SNA's 2017 Position Paper. Click here for full SNA's Talking Points. Click here for information from SNA on Block Grants. Click here for information from SNA on school breakfast commodities. SNA does not have a position on these sorts of bills. SNA staff did speak with one of the cosponsors staff. No action is expected on these bills. SNA is maintaining its previous position of not weighing in on bills that are not part of any organized reauthorization of CN programs--unless it's on block grants. Availability of an exemption to the Paid Lunch Equity (PLE) requirement for school food authorities (SFAs) in strong financial standing has been extended through School Year 2017-18. State agencies should exempt an SFA from the PLE requirements at 7CFR210.14(e) if the SFA requesting the exemption has been certified as meeting the meal pattern requirements and can demonstrate that the required increase to paid lunch prices or revenue contributions would cause the SFA to exceed the 3-month operating balance limit. State agencies are asked to distribute the U.S. Department of Agriculture's (USDA) memo announcing this update to operators immediately. Earlier this year, USDA hosted a public contest to solicit design concepts for an open source web-based school meal application prototype. Drawing on the innovative strategies submitted, USDA partnered with a talented team of private-sector technologists through the Presidential Innovation Fellows program to create an official web-based prototype application. The resulting streamlined prototype is now available on the FNS website. For more information on the web-based prototype application, register for a webinar hosted by USDA on Dec. 15, 2016. Speaking of school lunch,Donald Trump said in his interview for "The Dr. Oz Show," which aired Thursday, that inadequate food budgets and a lack of sports programs are helping to fuel the country's childhood obesity epidemic, reflecting a point of view that seems to agree at least partly with that of first lady Michelle Obama. The Republican presidential nominee was asked how he would handle America's obesity problem, particularly in children, by a member of the audience who identified themselves as a teacher. "That is a school thing, to a certain extent," Trump said. "I guess you could say it's a hereditary thing, too. I would imagine it is certainly a hereditary thing. But a lot of schools aren't providing proper food because they have budget problems and they're buying cheaper food and not as good [of] food." He then went on to emphasize the importance of sports in schools. A report issued on July 8, 2016, by the Center on Budget and Policy Priorities (CBPP) says block grants would put children's nutrition at risk. The School Nutrition Association is taking a stand against a House GOP child nutrition bill that would open the door to block-granting federal school meals programs. The group, representing some 55,000 school nutrition professionals across the country, on June 15 held a public event on the Capitol aimed at drumming up opposition to the bill - marking a new round in a long-running fight. For years, SNA worked with House Republicans to push back on some of the Obama administration's new nutrition standards, but that alliance was severed when the House Education and the Workforce Committee last month introduced legislation that would create a three-state block-grant pilot for school meals programs - a move SNA and hunger and health groups see as an existential threat. Read coverage from The Hill. Read coverage from the Miami Herald. The 2017-18 Annual Report is now available on SchoolNutrition.org! Within, you’ll find a look back at highlights of the Association’s activities over the past 12 months. The Report details the numerous ways that SNA members, leaders and staff have faced and risen above challenges to continue to do the work that matters most: feeding America’s children. The SNA Financial Overview for 2016-17 is also available for your perusal. SNA invites you to share these reference tools with prospective members, school administrators and other community stakeholders to illustrate the value of SNA membership and the important work the Association does to help its members succeed every day in America’s schools. SNA values feedback from its members and is committed to ensuring transparency of its governance. The Report is now being published in the fall to reflect the past year’s financial performance as confirmed by the annual audit. You’ll be sure to feel a sense of pride when you review the many accomplishments made on your behalf by your national Association in 2017-18. Click here for updated USDA guidelines.